Exclusive for NEW FEMALE customers aged 21 years old & above with weight problems. Guarantee of up to 2kg or 8-22cm loss in first session. No surgery, no diet pills, no strenuous exercise and no crash diet. Internationally-received weight loss and management solution. The slimming session(s) is available at any 17 London Weight Management outlets in Peninsular Malaysia. For enquiry, contact HOTLINE at +603-2614 1234. London Weight Management reserves the rights to amend any of the terms and conditions without prior notice. For enquiry, please contact us at +603-2776 1234. This product is non-exchangeable for gift or cash. This promotion is non-exchangeable for cash and cannot be used with other promotions or offers. 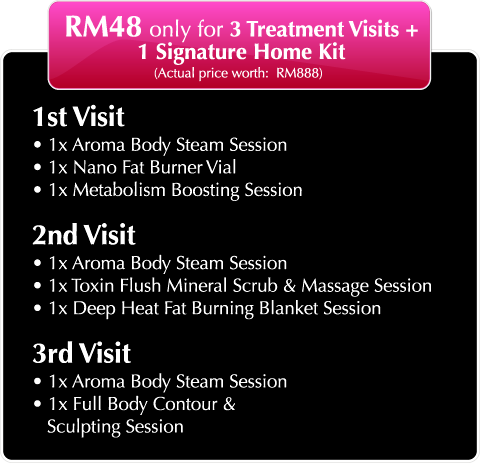 For RM48 offer, all treatments specified must be completed in 3 visits only. For Free Trial selection, you will experience one slimming treatment in one visit. This Notice is issued to all our valued customers pursuant to and in compliance with the Personal Data Protection Act 2010. If you contact us, we may also keep a record of that correspondence. During consultation or in the course of providing services to you, your information such as images, treatment results and details of visit may also be collected and recorded. We wish to inform you that it is necessary for us to process your personal data for the above Purposes. If you fail to supply to us the above personal data, we may not be able to process your personal data for any of the above Purposes. Your personal data was, or may be collected in the future, from the information you provided us in the Package Acknowledgement Form, Customer Consultation Card and any other documents. Disclosure will only be made to our officers, employees, agents, and/or representatives, as well as that of our related corporations, strictly for the Purposes and on “need to know” basis and to comply with all applicable laws, rules, regulations, guidelines and/or other legal requirements. We endeavour to take reasonable precautions to ensure that the personal data that we collect and/or process are accurately reflected in our systems in accordance with the details provided by you. Therefore, the accuracy of the personal data depends to a large extent upon the information you provide. You may at any time request access to, make amendments to and/or obtain a copy of your personal data which are stored in our record. To exercise your rights, please email our Data Protection Officer at feedback@london-wgt-mgt.com.my. We will endeavour to respond to your request(s) within 14 working days after receiving the same wherever possible, but we may charge you a reasonable fee for doing so. Upon receiving the aforesaid request(s) from you, we may request you to provide personal details in order to verify your identity. By communicating with us, using our services and purchasing products from us, you acknowledge that you have read and understood this Notice and agree and consent to the use, processing and transfer of your personal data by us as described in this Notice. We shall have the right to modify, update or amend the terms of this Notice at any time by placing the updated Notice on the websites. By continuing to communicate with us, by continuing to use our services, and purchasing products from us following the modifications, updates or amendments to this Notice, such actions shall signify your acceptance of such modifications, updates or amendments. In the event of inconsistency or conflict between the English version and the Bahasa Malaysia version of this Personal Data Protection Notice, the English version shall prevail. Handpicked by London's weight specialists to burn fat, detox and trim your body! Now you have a choice of 3 Signature Treatment Sessions for RM48 or 1 Trial Treatment for FREE! Have you tried of visited London Weight Management before? By submitting this form, I agree to the Terms & Conditions of the contest and allow London Weight Management's staff to use any information submitted for their marketing purposes. *One redemption per new female customer above 22 years old. Not valid with other offers or promotions.